Aaron Scott edged out Brian Ruhlman to win a thrilling B&P Wrecking Late Model Feature Saturday night at Oakshade Raceway. Scott started on the outside of the front row and grabbed the lead at the start of the 25-lap feature that would run from green to checkered without any cautions. While in lapped traffic, Ruhlman got by Rick Delong to take over the second position. Justin Paxton also approached the front working his way up to third. Ruhlman reeled in leader Aaron Scott in the closing laps and began to put the pressure on. The two raced side by side on the final lap with Scott on the outside and Ruhlman underneath. Ruhlman surged ahead slightly in turns three and four, but Scott had the momentum coming off the final corner and took the victory by inches over Ruhlman. 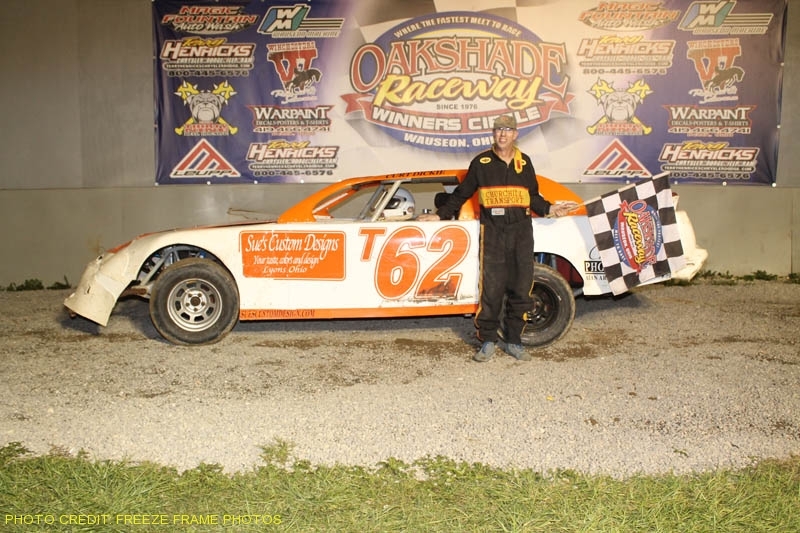 It was Aaron Scott’s third late model feature win of the year at Oakshade and his win kept Brian Ruhlman from winning two in a row after winning the previous week’s American Late Model Series feature. Rusty Schlenk once again started deep in the field and managed a third place finish with Casey Noonan fourth and Justin Paxton falling back to finish fifth. Greg Martin took top honors in the special “Crack the Whip” exhibition race, leading the entire distance. Last week’s feature winner in the sportsman division was taken out of competition early after getting together with Jamie Grochowski on the first lap of the event. Tim Line brought out the second yellow after spinning on the restart. Once some green flag laps were run, sportsman points leader Tim Fisher found himself out in front with Mike Jessen and Chris Keller close behind. Keller and Jessen closed in on Fisher and challenged for the lead. Keller went around Jessen on the high side and then got alongside Fisher for the lead. Keller had the lead for a moment, but got pinned behind a lapped car that allowed Fisher to regain the lead and eventually pull away. Fisher went on to win his second sportsman feature of the year with Keller taking a strong second place finish just edging out Joe Derbeck who finished third. Ray Klawitter and Jeremy Grover rounded out the rest of the top five finishers. Action heated up early in the bomber A Main when Matt Shipley had problems in turn one on the first lap and collected the 14 of Dan Bliekamp. With Josh Steinacker leading, the second yellow flag flew on lap three after Gary Domoe lost a wheel in turn two. Back under green, Steinacker began to pull away with the lead from Andy Borton who had a good run going until he fell off the pace on the backstretch on lap 11 and retired to the pits. Steinacker went on to pick up his third bomber A Main win of the year with Ted Goetz Jr. and Jim Scout finishing second and third respectively. Richard Patton started from the pole in the bomber B Main and led the entire distance of the event to pick up the victory. A couple of hard crashes slowed the event with yellows. The first of which came out after Cliff Barnard and Kyle Light made hard contact entering turn one and collected the 27 of Steve Dempewolf on lap two. A few laps later Bob Zuver and Jarrett Rendel got together on the front stretch and smacked the wall. Danny Hogrefe and Chris Howard gave up second and third on the restart after both cars slowed with mechanical problems. Randy Roseman challenged for the lead late in the race, but he too fell off the pace allowing Patton the easy win. Jacob Gamber finished second followed by Bob Zuver (who came back after his earlier crash), Dace Sibberson and Rex Strow. Chris Williams led the first lap of the bomber C Main with Ron Tolles taking the lead on lap two. Third place was not the place to be in the C Main. B.J. Gregory gave up third and fell out of competition. Carl Mapes later gave up third after spinning a short time later. Ron Tolles went on to pick up the victory over Chris Williams, David Goben, Terry Dempewolf and Allyn Goodlock. More great racing action continues Saturday, August 21 as the late model, sportsman and bomber divisions once again invade Oakshade Raceway.